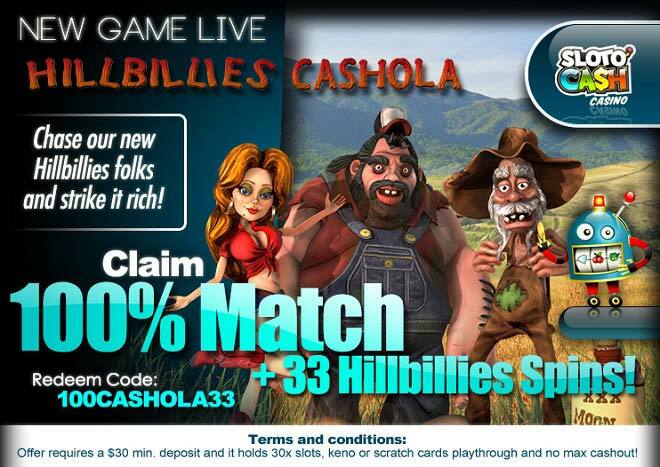 Are you ready to welcome the Hillbillies Cashola family to our selection of video slots? Roll out the red carpet and help us greet this new rich family with 33 Free Spins + a 100% Match on your next deposit! With 5 reels and 20 paylines, this video slot game is packed with chances of you striking it big too! Win more with the help of free spins, multipliers, and even a progressive jackpot prize. Expect to see all the members of the Cashola family on the reels, including Chase Billy Bob, Billy Bubba, and Billy Jo. Land all three of these good ol’ folks and your payout will be multiplied times 20! When you land at least two of the Hillbillies you’ll be triggering the free spins round. If the characters appear during the free spins, you’ll be claiming an extra eight spins, plus other special prizes! Great graphics, outstanding prizes and tons of fun are waiting for you when you hit the spin button of Hillbillies Cashola! Start collecting riches immediately with 33 Free Spins + a 100% Match!